Start your year out right with a special sparkling wine pick from our guest Jameson Fink. 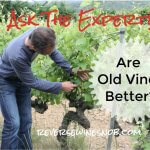 Today we have a special guest post by Jameson Fink who has been working in the wine industry and blogging about wine since 2004. Saveur Magazine nominated his site, jamesonfink.com, for a 2013 Best Food Blog Award in the Wine/Beer Category. He is a tireless advocate for year-round rosé consumption and enjoys a glass of Champagne alongside a bowl of popcorn. I encourage you to check out his site and his entertaining and informative podcast! It’s natural to not want to feel like a brute for trying to save some money on your holiday bubbles. While we’d all love to have a Champagne budget to flex when dozens of thirsty revelers descend on our residences for New Year’s Eve, that’s just not in the cards for the majority of people. 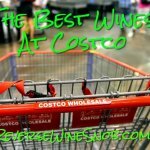 So in a nod to the tenets of The Reserve Wine Snob, I’ve got a satisfying and refreshing sparkling wine pick that’ll give you change back on your $20 bill. Before I get into too much detail about my selection, the NV Antech Brut Nature Blanquette de Limoux, I’d like to say something about the latter part of this wine’s name. If you’re looking for value bubbles, France’s Limoux region is a great place to explore. There’s the fancier Cremant de Limoux (but not Champagne-fancy in price) and the even more value-driven Blanquette de Limoux. Whatever you choose from Limoux, located in Southern France, you’re drinking some pretty damn historic stuff. When it comes to sparkling wine production in France, you can call Limoux “The Originator”, as monks down there were having fizz with their brunch in the early 16th Century, while folks in Champagne were working hard to keep their wine flat. Now, to the Antech. Blanquette de Limoux is made with a significant chunk of a mostly unfamiliar grape: Mauzac. 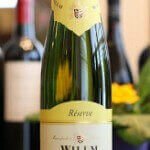 In this case, 90%, with the balance a split of Chenin Blanc and Chardonnay. So what’s the “Brut Nature” part mean? Well, if you are a fan of racy, lively sparkling wines, this is gonna be in your wheelhouse. A sparkling wine designated as “Brut Nature” contains no dosage, which is a little sugary vino added to curb some of the acidity before the final addition of the cork and cage. So if you like your sparkling wine untamed, check out this bargain buy. Finally, the back label of the Antech has a sentiment that I wholeheartedly agree with when it comes to bubbles: “…serve chilled [duh] for drinks either before or throughout the meal.” I can’t stress the versatility of sparkling wine enough. From Cava to Champagne, dry sparklers have an astounding ability to play nice with whatever food comes to the table. Think about that for the other 364 days of the year besides New Year’s Eve. Happy New Year! 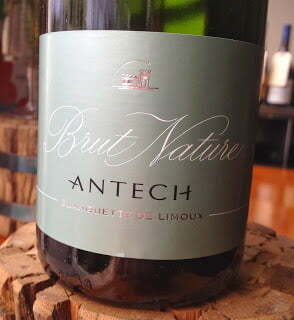 See a listing of local retailers selling the Antech Brut Nature Blanquette de Limouxhere.